ICICI Pru Guaranteed Wealth Protector is a unit linked insurance plan that offers the potential for high returns, by investing a portion of your money in equity, while also providing the dual assurances of Assured benefit# & life cover . *Tax benefit of Rs. 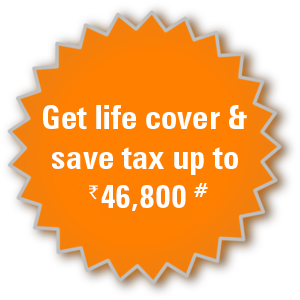 46,800 is calculated at highest tax slab rate of 31.2% (including Cess excluding surcharge) on life insurance premium u/s 80C of Rs. 1,50,000. Tax benefits under the policy are subject to conditions under Section 80C, 80D, 10(10D) and other provisions of the Income Tax Act, 1961. Goods and Services Tax and Cesses, if any, will be charged extra as per prevailing rates. Tax laws are subject to amendments made thereto from time to time. Please consult your tax advisor for details, before acting on above. ^^Loyalty Additions are applicable from the 6th policy year onwards. This is in the form of extra units at the end of every policy year. Each Loyalty Addition will be equal to 0.25% of the average of the Fund Values. You get an additional Loyalty Addition of 0.25% every year from the end of year 6 if all premiums for that year have been paid. +Wealth Boosters will be allocated as extra units at the end of every 5th policy year starting from the end of the 10th policy year. Each Wealth Booster will be 3.25% for Regular Pay policies and 1.5% for Single Pay policies of the average of the Fund Values. ^The Maximum equity exposure in this plan will be 60% or 45% depending on your age at entry. Over the time period, allocation to the equity will gradually decrease in order to provide capital protection. #On Maturity, you will receive higher of Assured Benefit or fund value. Assured Benefit will be 101% of total premium paid which is applicable only on maturity of the policy and does not apply on death or surrender.